In this brand-new edition of Ask Cryptic, Executive Producer Dan Stahl delivers answers to player submitted questions. Q: (th3gr4ndnagu5) You mentioned that Foundry Spotlight missions will be getting official rewards. Will these missions also get full Skillpoint rewards as well? 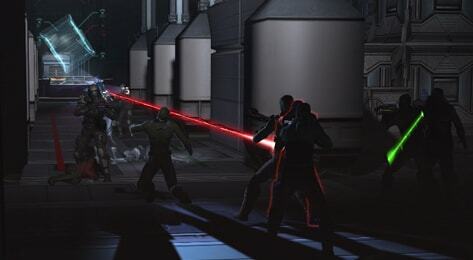 Dstahl: The rewards that will be offered will be done via a secondary mission, which Cryptic controls, rewarding players upon successful completion of a specific Foundry mission. The reward will be similar to the types of rewards that you receive from Episodes in that they will potentially grant numerics as well as items appropriately scaled to the Foundry mission. Q: (stoleviathan99) Can we expect premium species respecs soon? I play a “fake” Cardassian, like many, but would jump at the opportunity to make that a real Cardassian, particularly with Cardassian costume options. Dstahl: Someday, we would like to add the ability to reselect your species so that players can go back and reselect a different species for their Captain. Whether or not that will allow FED or KDF captains to reselect as a Cardassian has not yet been determined. If we also added the ability to wear a traditional Cardassian military outfit, it would be restricted so that it could not be altered or worn with other uniforms due to the geometry of the that particular outfit. While this feature has been discussed, it is not on our near term radar. Q: (ufpdodgers) With Fleet Starbases on the horizon and currently being tested on TRIBBLE, will we ever see the Fleet Cap raised above 500? Dstahl: Currently, the answer is no, but the nice thing about MMOs is that nothing is ever final, so that may change in the future. We’ve looked into average Fleet sizes and while there are a few large Fleets, the vast majority of Fleets currently contain less than 25 members. Thus, it is a game design decision to keep the current Fleet Cap of 500 members. Q: (ravin) Is there any way we can have a separate small craft list and Starship list to free up ship slots without having to decommission our small craft? Dstahl: We are still considering this issue. We agree that maintaining a large Fleet of ships is daunting and requires decommissioning and reclaiming in order to shuffle between the various ships you command. In the meantime, you will need to continue to swap your active ship roster and reclaim old ships in order to get around the ship cap. There are only a handful of players in this situation at the moment, but we do want to have a better solution in the future. Q: (angelus214) Given Starbases are designed for Fleet use and there are some big fleets out there, will there be Starbase instances that will accommodate more than 75 to 100 players we see on in game Starbases? Filling up the main foyers with 200 Fleet members would be awesome. Dstahl: The limitations on how many characters that can be in a zone at one time is defined by the performance of video cards rendering the amount of characters drawn on your screen at any time. Given that Star Trek Online uses newer graphics features, this limits the number of characters that can be drawn before characters simply aren’t drawn or drop out. This is why you’ll see some video games use tricks such as putting all starting players in the same costume or “ghosting” them in order to get a maximum number into the same space as possible. We could up the count of players in the same instance, but some video cards might not be able to draw all of them and graphics performance might be pretty bad. We have a dedicated graphics team at Cryptic continually looking to strike the right balance between number of players and performances. You will also see a change in instance cap numbers on occasion as we work with this team to find the right balance. Q: (moo8e) Will we ever see lock box ships be an account wide unlock when they are opened by one character? Dstahl: Not at this time. Lock box ships, along with the upcoming Fleet Ships, will remain tied to the character that achieved the goals necessary to obtain the ship. Q: (starcommando101) Will Starbases get to see PvP? Not just a normal Deathmatch PvP, but new forms of PvP like Espionage, Trade, Diplomacy, and more? Dstahl: It has been in our design all along that Starbases will eventually see PvP, and not just Deathmatch PvP. Season 6 is launching with Starbase PvE Challenges. Starbase PvP Challenges is a feature for a future Season. Q: (sierrafortune) Will ships that are made available through use of the upcoming Fleet System be made available by other means to players who do not wish to join a Fleet? Dstahl: Fleet Ships will be restricted to members of a Fleet who overcome the necessary challenges in order to obtain these top end ships. While we don’t expect to offer these ships to non-Fleet players, we have kept the limitations on being in a Fleet very low so that even if you are a Fleet of yourself plus Alts, you may effectively not join a Fleet and still face these same challenges in order to obtain the ships. Q: (zeuxidemus001) There have been statements that the Romulan Warbird will not appear in a lock box and is being reserved as a ship for a potential future Romulan faction. Does this mean that since the Jem’Hadar and Cardassian ship have already appeared in lock boxes, they will never exist as factions? Dstahl: The internal policy over which ships should appear in lock boxes changed shortly after the release of the Cardassian lock box (coincidentally, about the time I returned as EP to STO). So while this appears to be a nice contradiction, it doesn’t preclude the possibility of allowing these ships to become available for potential future factions. Nor does it mean that a Cardassian or Dominion faction are ruled out. As we move forward, the rare ships found in lock boxes are intended to represent “rare” craft or ships that would not be standard commissions within any primary Faction’s fleet. Q: (robinsonfamily) With Gozer leaving, will the PvP project he was working on still receive the same level of commitment? Can we expect an announcement from Cryptic Studios regarding PvP and who will now lead it? Dstahl: While I’m sad to see Gozer go, we have an amazing array of new content designers, such as Mr. Dods (Alpha, Starbase Incursion, Starbase Alert) who will be continuing the work on PvP as we move closer to the redesign of the system. We expect the updates to PvP to happen on our Test Server first and will not be going Holodeck until the PvP community has had ample time to provide feedback. We know that this will take some time, whether Gozer was working on it or not. Fortunately, the work already done is still there and will be continued. I wish Gozer the best in his future endeavors, but if you are worried his departure is going to slow down content production, it will not. We’ve hired several new content designers and the content team is rock solid. We will continue to make great content, such as what you are seeing in Season 6. Q: (deutchcraft) Are we ever going to see the Vesta class in game? Dstahl: Ask me again in one month. Q: (sparkle84) Any news on new STFs? Most particularly the re-working of “Terradome” to fit the current STF style, and more excitingly, “Into the Hive”? Dstahl: Yes, but I’m not going to share any details just yet. Look for some exciting STF news as we get closer to Season 7. Q: (four7alphatango) When can we anticipate seeing the species-specific combadges we first heard about a while back? Dstahl: Someone told me the other day that they are already available in the Mirror Universe. They have yet to be available in this one though. The reason why is that they were an art project of a long gone employee and never actually made it into the game. There is a chance you may see these someday in the future, but currently they are not on our schedule. Q: (icegavel) Since crafting stations will be available on Fleet Starbases, will there be a new Crafting System in Season 6? Dstahl: A crafting update is on the schedule for an update for a future Season (not Season 6). Q: (alastorforthrigh) Will we finally see a change to the STF droprates in any sort of meaningful number? Dstahl: This is on the schedule to be addressed as part of Season 7 and will make the Omega Fleet STFs more in line with how Fleet Advancement reward unlocks work. Q: (meurik) Is there a more definitive answer on what kind of mission content we can expect in the future other than dailies or events? Dstahl: Dailies is a tough definition. Most missions in Star Trek Online may be repeated daily. Even Featured Episodes are repeatable and sometimes even have special rewards for doing so. If the question was more along the lines of “are we going to make more play it once per character only” missions, the answer is probably “no” because we stopped making that sort of content shortly after launch. We do want players to experience new missions, but we also want players to be able to replay missions they enjoy. So, in terms of the kinds of missions to expect, Season 6 will introducing several new PvE Queue Missions, new Starbase Defense missions for Fleets, as well as a new ground zone (available all the time) related to the Tholians. Then, in Season 7, we will be introducing a new sector, as well as a variety of missions related to it. That variety may include a full range of mission you would normally find associated with a Sector along with perhaps even new types of missions. For more details on that content, you’ll have to wait until we are closer to Season 7. Right now we’re all about the great new content in Season 6. Q: (lanceare) Is there still talk of remastering some of the earlier episodes like City on the Edge of never and Future Imperfect? Dstahl: Not at this time, but as with any living MMO, the game is never really “finished” and so we reserve the right to go back and update older missions at any time. You’ve seen this in some older MMOs where they’ve gone back and remade entire starting zones. We generally don’t schedule this work in any specific season, as it tends to happen when a content designer is going back and fixing a bug or working on adding a new feature to a specific mission. As an example, a little while back we were looking at a bug in the KDF Federation Minefield fleet action. As a result, we completely remade the KDF Federation Minefield Fleet Action in the process. So these “remastered” missions do continue to happen as the game evolves, but there isn’t a specific schedule of what episode will be remastered next. Q: (fewzz) Any plans to add a reward merchant for the Fleet Actions to get them buzzing? So much wasted content here. Dstahl: Assuming that you’re referring to rewards tied to completing specific Fleet Action, there are some ideas about how we want to approach this. Currently, all of the new Fleet Actions introduced in Season 6 will be directly tied to rewards unlocked for leveling Fleet Starbases. We will be looking at ways to incorporate this theme into other Fleet Actions in the upcoming Seasons. Q: (imperialmirror) Right now on the TRIBBLE test server, the Fleet Starbases are a little empty. Will the interior of the Fleet Starbase change as the level of the Starbase increases? Dstahl: The interior of the Starbases are intentionally empty as we will be offering limited time projects that will allow Fleets to add modules and decorations to their Starbases so that over time, they will be able to fill out all that space with fun and interesting additions to make their base thriving. This transition will make the Starbase look less like a prefab installation (e.g. Regula Station) and more like a lived-in community (e.g. Deep Space 9). Q: (kalecto) How do you and the senior members of staff prioritize content updates after all of the changes that Cryptic has gone through over the past year? I’m asking this so that old and new members can have a better understanding of this process. Dstahl: It is often overlooked that Star Trek Online is a relatively young game compared to other MMOs on the market. We are only 2 years in the running, but in that time we’ve made massive overhauls and updates to the game and are about to release our 6th major Seasonal update. Prioritizing what comes next is the challenge of surviving in a rapidly changing MMO marketplace and making decisions that will not only help the game survive in the short term, but thrive and grow into the future. When looking at what to prioritize in each Seasonal Update, a lot of thought and discussion is given to finding the balance between addressing immediate concerns and laying foundation for the future. It requires being nimble without losing sight of the end goal. This is why in 6 Seasons of updates, we’ve not only addressed big issues in the game, but also introduced key new concepts and features that are intended to be a framework of future growth. The Foundry, Sector Space Revamp, Feature Episodes, Dilithium economy, Duty Officer Syystem and even the new Fleet Advancement System were all designed to move Star Trek Online forward into the future. STO is not yet in a place where we have the luxury of doing the same thing every update. There are still key systems and features that we need in the game before we can be happy that we’re set for the years to come. The key decision to move STO to F2P over the last year was crucial to our current success and while it was painful along the way, ultimately sets us up for the future. It really makes me wonder if other games such as SWTOR wished they would have launched F2P as well, because converting all the systems over to a new business is a huge challenge. Q: (starkaos) Will we ever see a Borg, Reman, or Aegis ground item set? Dstahl: Those sets are most likely finished and will remain as space sets only. That said, we do have more ground sets coming in the future, but they will be a new item sets and not necessarily related to the three you mentioned. Q: (akrilon) Are there any plans to incorporate voice over options for Bridge Officers or Captains in the near future? Dstahl: Not in the near future. We have discussed this feature for a long time. Cryptic has a strong belief in allowing players to have as much control over their character’s look and persona as possible. Considering all the options available in the character creator, it would require hundreds of unique voices in order to achieve the level of customization we want players to have. Unfortunately, given how much dialog is in our game, that is extremely expensive and most likely not in the stars for us at this time. That hasn’t stopped people like me from wanting it to happen in game, but currently there are some big hurdles preventing it. Dstahl: Amazing how this one mini-game continues to come up every single Ask Cryptic. It must be a very popular game in order for it to still be around in the future. I’ve no objections to it being in the game as it appeared several times in Star Trek series. It really just boils down to a programmer having a little extra time to do this as a side project. Unfortunately, our software programmers get very little extra time. Not ruling this out, but the odds are that this is just about as rare as a Royal Flush at this point. Not impossible, just improbable in the short term. Q: (ofallon) Why does a feature such as reselecting your species or traits need to be tied to a “Season”? Dstahl: Anytime we want to make underlying changes to the way the game works, it inevitably requires software programming. In order to allow the software programmers the time they need to ensure this type of major feature doesn’t completely destroy existing character data, that work is done in a software branch different than the “live” game on Holodeck. This allows programmers to alter data structures and database functions in safety. Any time you are making these changes you run the risk of potentially destroy character data by introducing nasty bugs. “Seasons” are STO’s name for updates or expansions to the game that typically involve releasing one of these software code branches into the live environment in a safe manner. This is why allowing players to reselect very basic information about themselves such as their species and traits needs to be done in a future “Season” and can’t be done over the course of a few weeks. It needs to be tested and verified on the internal database to ensure data corruption isn’t an issue. Q: (masterguid) Are there going to be any future missions where we could see Admiral Janeway, Ambassador Picard, or other characters from the TV Shows that might be alive in this timeline? Dstahl: We do not have any missions in the near term that feature old crew members, but we would like to feature these characters in story lines when it makes sense. Some of the missions we have discussed for future series may involve these crew members either in our timeline or another, so you’ll just have to wait and see if your favorite character eventually makes it into the game. Q: (ltsmith) Can you provide any info on a Voyager bundle? For example, will it have an interior or special white quality weapons like the TOS and DS9 bundle? Dstahl: When we make the Voyager bundle, it will have all the standard types of awesomeness that are offered in our existing bundles. Look for this in the coming year. Q: (dalolorn) Will we ever be able to customize our weapons? Dstahl: The ability to adjust or customize features of a weapon is one of the additions we are considering as part of our scheduled Crafting update to be released in a future season. Once we get closer to that release, we will share more details about whether this was included in the design. Q: (sollvax) Any chance of seeing TOS communicators and transporter effects made available as an option? Dstahl: There is a good chance that you’ll see these sorts of options pop up as either episode rewards or new items in the C-Store down the road. Q: (bandit656) I’ve seen in other posts that in the future we may have “Fleet Holdings” outside of just the Fleet Starbase. What may those holding be? Dstahl: There will absolutely be more Fleet Holdings. The next one will involve an “exterior” location and is rumored to be in the new sector being released in Season 7. Q: (aegon1ice) Obviously Season 7 will be all about Story. Can we at least expect to see a Romulan faction in Season 8? Dstahl: Who says a Romulan faction can’t be all about story? Q: (deewbot) How does it feel to know you have made one of the GREATEST MMO’s of all time? Because it is in fact my all-time favorite? Also I have to ask – Kirk or Picard? Dstahl: It feels pretty awesome. Working on this game is a dream come true. I’m looking forward to seeing where this ship can take us and hopefully history will remember us well.